The bleakest part of winter comes after the joy-filled holidays, and all you want to do is hibernate, curled up with a warm cup of chai, a bowl of popcorn and your favorite cinema guys. Julie and I did just that recently, in front of our own separate hearths to stoke the fires with some of our favorite Old Flames. Jenny K: My viewing last night was Aladin (2009). I decided I had to watch it after finding that delicious BigB rap clip I put in the earlier post after LittleB’s rap in Dum Maaro Dum. I am glad I decided to rent it from Amazon rather than buy it on DVD (though the price was fine). I didn’t like it enough to own it, but it does continue my desire to see all of the later Amitabh Bachchan performances that I can get my hands on. I do like his old films, but I think it’s something about the gray hair, and the extra-milage twinkle in his eyes, that has given him bonus appeal for me. The best thing about Aladin was that it provided a really larger than life part for Amitabh, something he could really sink his teeth and sense of humor into. I love him in his comedies even better than his dramas. This wasn’t quite as good as Bunty Aur Babli for him, but a real lot of fun. He stars as a “real life” genie named Genius (such a stretch by the screenwriters!) 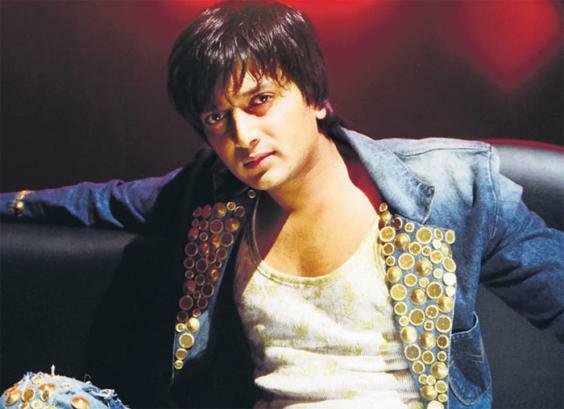 who emerges from the lamp rubbed by our hero, Aladin Chatterjee, played with a shy, wistful appeal by Ritesh Deshmukh. Julie M: I need to see more of Ritesh. The only thing I’ve seen him in was Bluffmaster! and I really liked him there. Too bad he mostly stars in silly comedies like Double Dhamaal, the likes of which I don’t even watch in English. Jenny K: Aladin is fully aware of the incongruity of his name. He could hardly not be, as he is daily chased and tormented by a group of bullies at school, led by Kasim (Sahil Khan, who resembles a musclebound Rob Lowe in his St. Elmo’s Fire days…which could have soured me on him right there, but it didn’t). These tormentors insist on Aladin rubbing every lamp they throw at him to find “the magic”. Aladin’s parents died on a hunt for that very lamp, because they believed in the magic, too, and baby Aladin was raised by his grandfather. Now, grown up, he doesn’t want magic, all he wants is to fly under the radar and be allowed to live in peace…until the new, beautiful exchange student comes to his school, Jasmine, played by beauty queen du jour, Jaqueline Fernandes. She’s lovely, sweet, and not a bad ingenue. And everyone is in love with the new girl from America, including Aladin’s arch enemy, Kasim. Now, Aladin definitely needs help winning her heart, and one of those lamps finally produces it. BigB emerges magically and immediately gets the party started at the school mixer. Julie M: Kind of reminds me of the school dance scene in Main Hoon Na; still one of the best Grease rip-off scenes ever. Jenny K: Well, the rest of the movie involves various schemes to make this romance come out true. Amitabh hams it up, delightfully, all over the place, changing clothes as much as any good Bollywood Item Boy, trying to get Aladin to use his three wishes so he can retire from his genie occupation, for good. He steals the show. Here’s that rap number again. I love the wig. Long hair looks great on him, though it’s a little too banana-curly in the back in one or two shots. Julie M: Here’s where we part ways. I really don’t like him in long hair. I think it makes him look like a crazy person. Case in point: Jhoom Barabar Jhoom…OK, he’s actually pretty cool as a character that keeps popping up to wink at the action, but he LOOKS crazy. Jenny K: I must just like his “crazy” then…the only reason I bought JBJ was for that particular look on Amitji. Too each her own, I suppose. The main negative for this film is in the completely unnecessary subplot of The Ringmaster, an evil, all-for-himself ex-genie, trying to find the lamp so that he can end his earthly exile and become a genie once again…it’s all tied together with the reappearance of comet that is due to fly right over Aladin’s town (during the annual Student Ball, of course). Sanjay Dutt plays this villain with way-over-the-top gusto and the wardrobe of Johnny Depp’s Mad Hatter on steroids. I really could have done without. 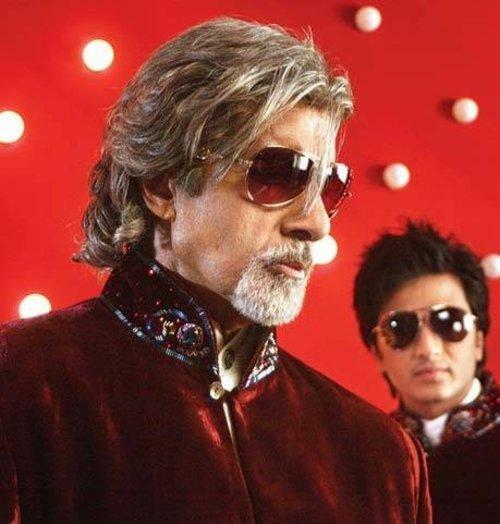 Amitabh’s charm alone could have done it for me, and does, so I’d give it three cups of chai out of five, for a warm-up factor, on that alone. Here’s the Cyrano-esque wooing scene to leave us with (Aladin temporarily has no voice because he’s been karate-chopped in the throat, and has to use his best playback synch skills). Julie M: Ha! Freeze that video at 0:49 and he becomes Long-Haired Crazy Person again. But I like that he’s often cast in non-Dad roles now where he can have some fun. Maybe he’s making up for all that “angry young man” work earlier in his career, where he didn’t get to smile much, even in fun roles like Amar Akbar Anthony. And how much are you looking forward to seeing him in The Great Gatsby later this year, even in what is little more than a walk-on? And I need to see Zanjeer. They really don’t make them like him anymore. Julie M: Had to get an Akshay Kumar fix, so I got 8 x 10 Tasveer (8 x 10 Photograph, 2009) from the library. If you haven’t seen it, it’s available free on YouTube or here. Jenny K: Though he’s not one of my favorites, I give Akshay much more credit when he’s in dramas rather than his action or comedy roles. Except for Waqt. Never going to like that one. Julie M: It’s a good-enough (but not superb) psychological thriller in the mainstream European/American film style. Akshay stars as Jai, a mild-mannered park ranger—or environmental monitor, it’s difficult to tell—in Canada with the semi-secret, supernatural ability to stare at a photo, go into a trance and see the scene from the photo subject’s eyes (yeah, I thought that was pretty ridiculous too, but you kind of have to accept this premise or else the whole movie will fall apart). When his estranged father (Benjamin Gilani) dies of an “accident,” Jai is convinced it is murder and uses his abilities to track down the killer. He finds no dearth of suspects, possibly including his own mother (Sharmila Tagore), and his life is endangered on more than one occasion. There is a huge and highly satisfying twist about 3/4 of the way through, and the final 30-45 minutes are edge-of-your seat action and suspense–which sort of made the first 30 minutes or so worth it. A very bad rap song over the end credits made me think Akshay and Abhishek have some sort of competition going. If you’ve not seen it I won’t spoil the twist for you. Sharmila’s talent was pretty much wasted in this film except for one scene, but it was nice to see her acting again. Jaaved Jaffrey has a supporting role as the dead father’s former protege, a disgraced police officer with “Monk”-like OCD qualities, who helps Jai in his quest for the truth. As usual, Jaaved’s voice is marvelous but I found myself continually distracted by a bad redhead dye job and the worst haircut ever. Ayesha Takia plays Jai’s doe-eyed and adoring girlfriend. And also as usual I was mesmerized by Akshay. Those looks! That smile! The stunts! He deserved a better script than the writer gave him, but he made the best of it, and as I said, the last part of the movie made everything before it worthwhile. Jenny K: I would be more moved to see this film if it didn’t seem to have Akshay playing Faye Dunaway in The Eyes of Laura Mars. 1978 isn’t so far away that us old folks don’t remember. It was a plot with Faye being a fashion photog who may be seeing the brutal work of a serial killer through his eyes, both at night, in her dreams, and while awake. It even begins to influence her work. Just changing him to a park ranger doesn’t change the basic premise, does it? Akshay does have a killer smile, though…I grant him that. Coincidentally, B and I had just watched the very bad 1991/2 film Sketch Artist, where a police sketch artist takes a murder witness’s description and realizes he’s just drawn a portrait of his wife. He spends the rest of the film trying to figure out if his wife really is a killer or if he’s just obsessed with their ebbing relationship. Another psychological thriller, but one so cheesy and dumb so we were in the mood for a good one to take the bad taste away. B watched 8 x 10 with me and thought it was decent. Not stellar (it wasn’t), but it worked. Jenny K: Now, I must say, you may have warmed up my interest in that one…February chills aren’t over yet, and one can always use new flames to go with those older ones! Feb. 7, 2012: Hravished by Hrithik, Part 2 – Mission Kashmir & Guzaarish February 14, 2012: Isn’t It Romantic?